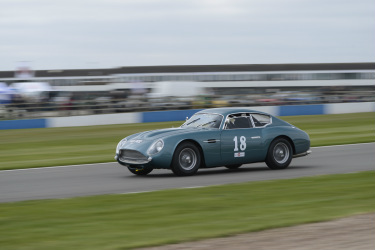 The Aston Martin DB4 GT Zagato was the epitome of the gentleman racer's car, one that could be driven to a circuit in comfort, raced competitively and then driven home again. FAS 302 does exactly that, a delight to drive on the road and a winner on the racing circuit. FAS 302 is a 1960 Aston DB4 Series 2 rebuilt to the exact specification of the first Aston Martin DB4 GT Zagato made. There is no finer replica available today. FAS 302 is the result of an Aston Martin enthusiast wanting the ultimate road / race car. With only 19 DB4 Zagatos built and an original costing over £6 million he decided to rebuild a standard 1960 DB4 to the exact specification of a DB4 GT Zagato . This process took three years and has produced a car that is wonderful to drive on the road and competitive on the race circuit. Finished in 2013 FAS 302 won its very first event, the Aston Martin Centenary Race, at Brands Hatch in July 2013. The owner has three other racing DB4s and, on the basis that one can only have so much fun, one has to go. FAS 302 is based on a 1960 DB4 Series 2 with chassis number DB4/272/R. The car has been rebuilt to the specification of the first DB4 Zagato ever built, chassis 0200/R, a car that had various features that were not found on any other Zagato, the obvious ones being the treatment of the rear quarter windows and the "shark nose" front section. The car has only correct period Aston components and a huge effort was made to source the special Zagato parts. Understanding that no one company can honestly claim to be the best at every skill required for such a project the owner selected the most capable Aston specialists for each element of the building process to produce an exceptional car that is almost indistinguishable from an original. Every mechanical part has been checked and then renewed or rebuilt to the original specification. The standard DB gearbox was stripped and rebuilt, the rear axle rebuilt with upgraded limited slip diff, half shafts and oil seals, the correct Girling brake callipers were sourced and the engine built to the original 3.8 litre twin plug specification producing a genuine 338 bhp. The engine internals were uprated to include Cosworth pistons, "H" section con rods, lead free twin plug head, billeted and balanced crankshaft, etc. FAS 302 comes with the original "Buff" logbook showing the car was sold in March 1960 to the lorry maker ERF Limited in Cheshire (Edward Richard Foden), confirmed by a copy of the original factory build sheet. The Aston Martin Owners Club records show that in the first year of ownership Mr Foden entered the car in the 1961 RSAC Scottish Rally and came 7th overall and 3rd in Class. The car is finished in Elusive Blue, the colour of DB4/272/R when it left the factory, and is trimmed in black leather. The car has a current V5C and MOT as well as new FIA HTP papers.